Is there a link between stress and health problems? The phone is ringing. Your father is ill. Your children need help with their homework. You’re on an impossible work deadline. Just reading this litany is enough to make anyone’s blood pressure rise. While it’s not possible to avoid all stressors, it is possible to learn to manage stress better. Why is stress management important? Not only does stress take an emotional toll, it can also seriously damage your health. We talked with stress management expert Patricia Bloom, MD, F.A.C.P., Director of Integrative Health at the Martha Stewart Center for Living at Mount Sinai Medical Center in New York City. She shared her advice on a powerful stress reduction tool and why it’s important to lower your stress levels today. Q: Is there a link between stress and health problems? Dr. Bloom (PB): There is a direct link between stress and many health issues. Some people are more “stress-hardy,” but for many, the effects of chronic stress over time are damaging and can cause or contribute to many diseases. Researchers have found that, over time, the stress response becomes damaging and chronic or repeated stressors have the potential to produce illness. That potential has its roots in how the body reacts when it is in a state of acute stress response. Q: Your practice specialty is geriatrics. How did you become interested in stress management? PB: A few years ago, after a very high stress period in my life, when I could tell that stress was making me sick, I decided to learn about stress reduction for myself. I became a yoga teacher, and trained with the Center for Mindfulness in Worcester, Massachusetts, learning a technique called Mindfulness-Based Stress Reduction (MBSR). I felt its benefits so deeply for myself that I decided to start teaching patients. Q: What is Mindfulness-Based Stress Reduction? PB: MBSR was developed in the late 1970s at the University of Massachusetts Medical Center by Dr. Jon Kabat-Zinn. The curriculum he developed is now used in over 200 medical centers, hospitals and clinics around the world, including some of the leading integrative medical centers. 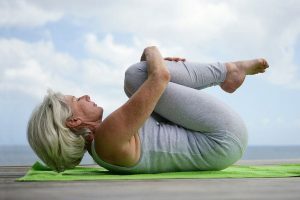 MBSR includes four components—sitting meditation, walking meditation, yoga, and body scanning (a relaxation technique similar to yoga nidra). The MBSR curriculum is a standard curriculum. It’s an eight week course that meets once a week for 2-2 1/2 hours. There is also usually a special weekend retreat day. Participants are expected to practice the mindfulness practices at home for 30-45 minutes per day. People can continue to practice on their own once they’ve learned the techniques, but it’s almost always helpful to continue to attend refresher sessions or workshops, or to practice in regular group sessions. Q: Is there scientific evidence that supports the clinical benefits of MBSR? One study found that MBSR combined with standard cardiac rehabilitation reduced mortality from coronary artery disease 41 percent in a two-year period of practice. For people with high blood pressure, MBSR was found to reduce blood pressure an amount comparable to the reduction achieved with anti-hypertensive medication. Another study found that it significantly lowered blood sugar levels in people with poorly controlled diabetes. Q: Who can benefit from this approach to stress management? PB: It can be beneficial for people of all ages. I’ve seen it help older patients dealing with chronic disease, the stresses of care giving for an ill spouse, and those faced with loss. Mindfulness is designed to complement medical care. It is a way we can become active participants in our health care and learn a new way to respond to stressful situations rather than simply reacting to them. Q: Where can people find an MBSR program in their area? PB: People can find MBSR teachers by going on the Center for Mindfulness website and clicking on the link Other MBSR Programs worldwide.